Do fan campaigns ever work? With Community still in questionable limbo, it's time to step back, assess past save-our-show protests, and learn from those motivated viewers who did succeed (however briefly). Which fans saved their series, and what can they teach us today? One of the first great fan campaigning success stories. 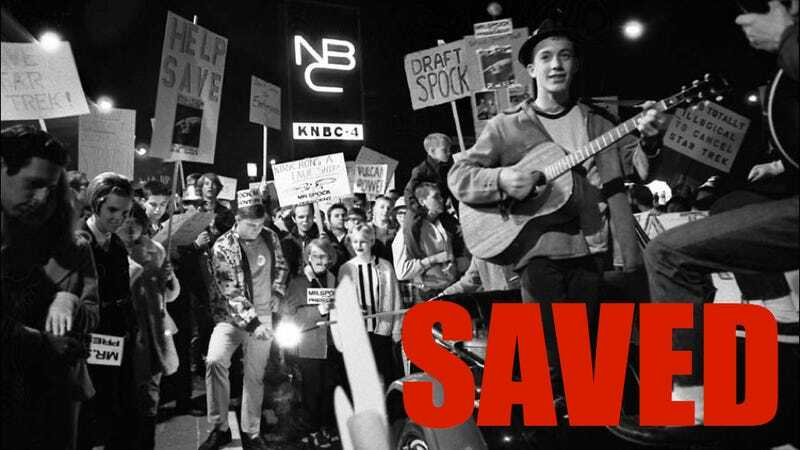 Demonstrations outside of the NBC offices and studios along with a colossal letter writing campaign, had a massive impact on the renewing of the original Star Trek. Execs admitted that the fans were heard and gave the green light to one more season of Star Trek in 1969; sadly, it was promptly cancelled that summer. The above image is from the LA Times vault. In this photo snapped by photographer Harry Chase on January 8th, 1968, you can see a group of Caltech students protesting outside of NBC's Burbank studios. You got our attention; your emails and collective voice have been heard. As a result, CBS has ordered seven episodes of "Jericho" for mid-season next year. In success, there is the potential for more. But, for there to be more "Jericho," we will need more viewers. Alas, they didn't get more viewers, and Jericho was cancelled shortly after the next year. Fans sent in the hot teen aliens' favorite sauce, Tabasco, to prove that "Roswell is Hot." The studio received up to 6,000 bottles and in turn renewed the UPN drama for two additional seasons. The WGA strike put Reaper — a cute show about a one fella's day job as a soul stripper for Satan — on the chopping block. Cast member Tyler Labine lead the fan campaign by prompting fans to send in letters and socks as a shout-out to "Sock," his character's name (although we read online that he kind of botched the job by posting the wrong address to the studio). But the fans were apparently heard. With very little in the hopper, CW renewed the show for one more season, but unfortunately it didn't get a third. "Leapers," or fans of the body-jumping TV show, sent in a hefty letter-writing campaign when NBC tried to crush their series' third season by moving it to the dreaded Friday night time slot. As noted in this 1991 Entertainment Weekly article, show creator Donald Bellisario even refused to sell NBC his new cop show if they kept pushing Scott Bakula around. Then the 2,500-member advocacy group Viewers for Quality Television, which was instrumental in keeping Designing Women and Cagney & Lacey on the air, also sent letters to the network. "It struck me as absurd that this would be viewed as a throwaway show," says the group's president, Dorothy Swanson. All told, NBC entertainment president Warren Littlefield says, he received "about 7 billion" letters urging him to bring the show back to its Wednesday home. (It was reportedly 50,000.) One fan simply wrote, "Here's the deal, Mr. Littlefield: Move it back to Wednesday night and your family is safe." Kim Possible fans' internet petitions and letter-writing campaigns convinced Disney to save the show for a third season. Perhaps the most inspired of all fan campaigns (that worked). Instead of mailing random items to flood the studio's mailboxes, fans spent their money on potential advertisers. Chuck was in danger of cancellation after its second season. But fans helped revive the series by going out and buying Subway sandwiches. Chuck fans were shameless in their promotion of the hoagie chain, and it worked. Series star Zachary Levi even lead a march of some 600 fans into a Subway on a sandwich-buying spree (at left). Fans put their money where their mouths were and Subway helped cover the costs of a third season. Sadly, it meant this fifth season will be Chuck's last. While the Browncoats couldn't save Joss Whedon's space Western series from Fox cancellation, the massive fan reaction (conventions, letters, petitions, and this giant add in Variety) did help get the okay for the movie Serenity, which gave fans a modicum of closure. The same could be said of Twin Peaks. While the fan campaign didn't save the series, it did help convince ABC to air the last six episodes. And after the network exiled the series to Saturday nights, put it on hiatus, and forced David Lynch to reveal the entire mystery behind the series in the middle of the second season, I suppose that's a win. Additional reporting from Sophie Bushwick.